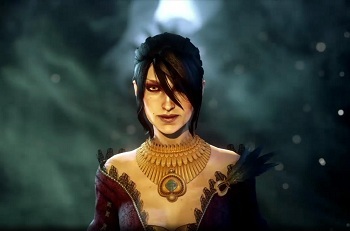 EA says Dragon Age: Inquisition is less a direct sequel than a new story in the world of Thedas. When Dragon Age: Inquisition was first unveiled, it was announced as Dragon Age III: Inquisition. There probably weren't more than a handful of gamers who gave this a second thought since, after all, it was the third game in the series and a sequel to Dragon Age II. That said, in a recent teaser trailer released during E3 the "III" portion of the title was notably absent. According to Electronic Arts this was the result of a deliberate decision top drop the number from the game's title. "I think there's always this debate over numbers versus no numbers, what works, what doesn't work," said EA Labels president, Frank Gibeau. "We felt like we wanted to bring more attention to the word Inquisition, because that's more the story arc of what it's like. There's a whole bunch of gameplay and features and big story choices related to how you go through this Inquisition that happens in the world." According to Gibeau the move was also made to help drive home that Inquisition will be less of a direct sequel and more of a new story taking place in the Dragon Age universe. "We just wanted to draw more attention to the fact that Inquisition is an all-new chapter inside of the Dragon Age universe, as opposed to people expecting a follow-on to Dragon Age 1 and 2 in a literal, linear sense." The move is arguably a smart one on the part of EA. While some loved Dragon Age II, there were many fans who outright loathed the second game. Dropping "III" from Inquisition could, in turn, help to separate the new game from Dragon Age II while returning to the no numbers style of Dragon Age: Origins and its expansion Dragon Age: Awakening.